Sullivan Tire and Auto Service invites you to kick off the football season with us in style! We’re bringing the Bridgestone NFL Experience to our Bridgewater store Thursday, September 10th – Saturday, September 12th! Jump in the foam pit and catch a pass, play the Madden Gaming Tower and meet past Alumni players Dan Connolly, Andre Tippet and Joe Andruzzi! We have some great tires sales going on as well! All Tires are on Sale! Get a $60 INSTANT Rebate on the purchase of any 4 tires! Come on by for some family fun! Hope to see you there! It is an exciting time of year as college football is right around the corner! Last year’s season ended in very dramatic fashion as it was the first year with a new playoff system for the BCS (Bowl Championship Series). Instead of the top two poll teams advancing, the top four advanced. The one seed plays the four, and the two plays the three. Alabama was the highly touted number one seed, a high octane Oregon was two, Florida State led by number one overall draft pick Jameis Winston at three, and a controversial Ohio State sneaking in at four. Ohio was using their third string quarterback and was ranked number 6 heading into their last game against the powerhouse Wisconsin. New quarterback Cardale Jones led Ohio to a dominant victory, which leap frogged them from 6th to 4th seed. Oregon was able to beat Florida State handily and Ohio pulled off an upset against Alabama. In the end it was Ohio who was able to hold off the strong Oregon offense and score in bunches to win by an impressive margin of 42-20. Looking to repeat, Ohio is ranked #1 heading into the season. They currently have a quarterback controversy as all three of the quarterbacks throughout last season stayed. Power houses TCU, Alamaba, Baylor and Oregon round out the top 5. Sadly, no teams from New England are ranked in the top 25, but schools like Boston College could make a huge impact by stealing a game from Florida State or another strong team. This particular college football season is set to be very exciting and interesting. The season is right around the corner and soon the upsets will begin to pour in. In the end, only four teams will make the BCS playoffs and one will walk away champion. Who do you think will win? Can any teams in New England make any noise? Not your average chips and dip recipe! It’s like a cheese-ball, but it’s peanut butter. With chocolate chips! YUM! Recipe courtesy of Crazy for Crust. Add powdered sugar, ½ cup at a time, and mix until combined. (If you want a stiffer mixture, add the extra ½ cup of powdered sugar.) Mix in chocolate chips. Turn out mixture on a large sheet of waxed paper. Use your hands to form into a football shape. Notes: If your mixture is too soft to form into a football shape, chill it for about 15-30 minutes. (The length of chilling time depends on how soft it starts.) The freezer will speed up this step. Do you have a favorite dip? Have you ever tried a peanut butter dip like this? Share your thoughts in the comments below. A fun twist on the traditional sub! Make this hoagie dip for family or friends and enjoy bite-sized deliciousness! Recipe courtesy of the Food Network. Carve out the center of the bread loaf to make a bowl (don’t cut through the bottom) and cut the scraps into bite-size pieces. Serve the hoagie dip in the bread bowl, with the extra bread and hoagie rolls to scoop it up. Yum! What is your favorite dip? Have you ever had one like this? Share your thoughts in the comments below! Who doesn’t like whoopie pies – right? This fun dessert may require some extra prep time, but it will be worth it in the end! It makes a great addition to any football gathering. Recipe courtesy of The Cake Blog. Preheat oven to 350°. Cream together shortening and sugar. Add egg and vanilla, beating well until blended. In a bowl whisk together the flour, cocoa, salt, and baking soda. Slowly beat in the flour mixture, alternating with milk, until blended. Using a cookie scoop, drop onto greased baking sheets. Then using a toothpick or butter knife to gently create points on either side of the circle, creating the shape of a football. Bake 10 to 12 minutes, or until firm. Cool on racks then fill with filling, below. With an electric mixer on medium high speed, beat butter and cream cheese until fluffy, 2 to 3 minutes. Reduce speed to low. Add sugar 1 cup at a time, and then vanilla, mixing until smooth and combined, scraping down sides of bowl as needed. If not using immediately, frosting can be refrigerated up to 3 days in an airtight container. Bring to room temperature again before using. Fill a piping bag fitting with a star tip with your cream cheese frosting. Flip one of your Chocolate Whoopie Pies over so the bottom is facing up. Starting from the perimeter, frost your whoopie pie, working your way in, until the entire circumference is frosted. Gently press the bottom side of another whoopie pie on top, creating a “sandwich”. Use the remaining cream cheese frosting to pipe football laces onto the top of each whoopie pie. Now you’re a crafty, baking expert! Try it out and let us know what you think. Do you have any foods you’d like to see a recipe for on our next Foodie Friday? Let us know your ideas below! With the Patriots heading into a playoff game against the Broncos this weekend, we have yet another Brady vs Manning match up. Today, we’ve got a special guest post from Tara (of Sullivan Tire’s Marketing Department), to give us her take on what to expect this weekend. As the resident Jets fan, it’s very hard for me to see the Patriots heading off to the AFC Championship game again, making a Super Bowl run again, but you have to hand it to Tom Brady and the Patriots; they really are elite performers when it comes to the playoffs. They are the crème de la crème of the postseason. Living in New England, with the Jets almost never being a factor when it comes to playoffs, the Brady/Manning showdown is something that a fan of a team with a quarterback problem can only dream about. (You mean fans actually stand behind their quarterbacks?) The excitement of seeing two future Hall of Fame quarterbacks, with a decade long rivalry, battling it out is something that you don’t always get to see with these types of elimination playoffs. This may be one of the best football playoffs in years. Even though I’m behind Manning (sorry! ), it pains me to say that I don’t feel confident that the team to beat Brady and the Patriots is Manning and the Broncos. And you know what? I should be worried. No offense to Peyton Manning, but let’s be honest here. Brady and the Patriots are postseason heroes. Brady makes his team perform at a higher level, and nowhere is this especially true than against Peyton Manning. 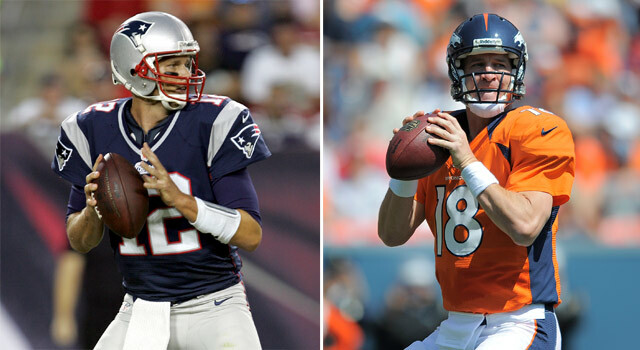 Since 2001, Brady has beat Manning 10 out of the 14 times when they have met in the regular and postseason, with Brady winning 2 out of the 3 postseason meetings against Manning. In terms of Super Bowl appearances, Super Bowl wins, and overall playoff wins, there is just no beating Tom Brady, darn it! Brady has twice as many playoff wins as Manning, 3 Super Bowl rings in comparison to Manning’s 1, and 5 Super Bowl appearances compared to Manning’s 2. Guess we’ll all just have to wait and see, but one thing is for certain: Monday morning’s mood will be dependent on the fate of the Patriots, especially this lone Sullivan Tire Jets fan. Do you think the Patriots will make it to the Super Bowl this year? Any game score predictions? Let us know what you think in the comments! Even though our favorite team isn’t playing tonight (Go Patriots!) we’re still excited to watch tonight’s game. Where will you be watching tonight? Who do you think is going to win? Are you in a fantasy football league? Let us know in the comments!